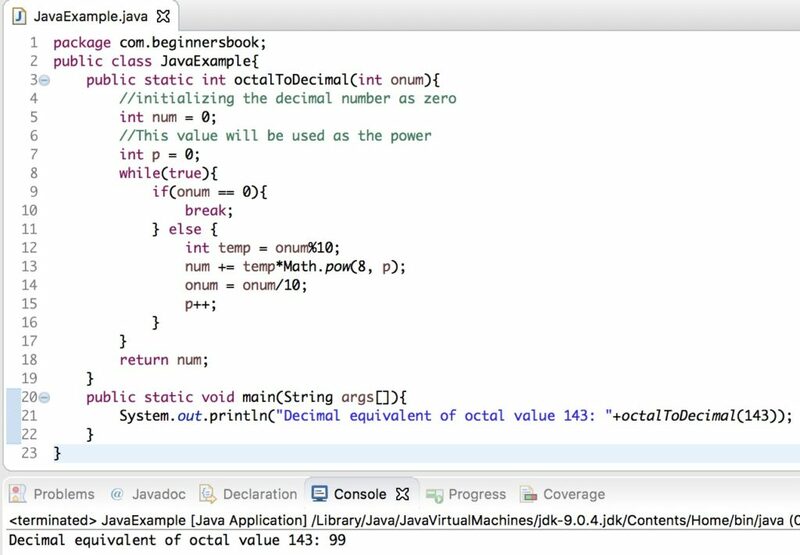 In this article, we will see how to convert Octal to Decimal in Java with the help of examples. 1. Using Integer.parseInt() method and passing the base as 8. 2. Writing our own custom method (logic) to convert octal to decimal. In the following example, we have an octal value stored in a string variable onum and we are converting it to a decimal value using Integer.parseInt() method. This method accepts String as an argument and converts it into a decimal value based on the base value provided along with the string as argument. Here in the Integer.parseInt() method, we have passed the base as 8 because the base value of octal number is 8. If you remember the hexadecimal to decimal conversion, we have passed the base as 16 for the conversion. In the above example, we have used the method Integer.parseInt() for the conversion, however we can write our own logic to convert an octal value to an equivalent decimal value. Lets write the code: Here we have used while loop and if..else statement.